Answer: The graph shows the percentage of the number of internet users in towns and villages from 2010 to 2014. The graph, at a glance, shows that he has been a steady growth of internet users both in towns and villages. In towns, the percentage of internet users was only 10 in the year 2010. This rose to 15% in 2011, 20% in 2012, 27% in 2013 and 40% in 2014. So, over the period of only four years, the percentage jumped from 10 to 40. The highest rise (13%) is noticeable in the year 2014. 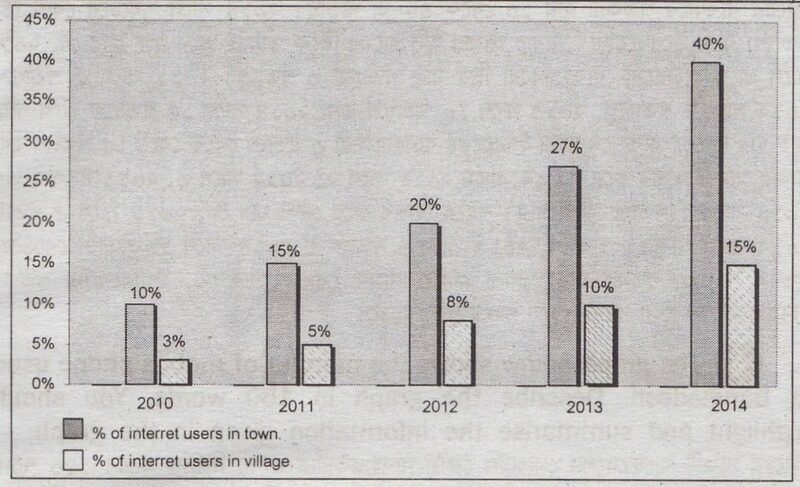 Again, if we look at villages we notice that the percentage of internet users was only 3 in the year 2010. This rises to 5% in 2011, 8% in 2012, 10% in 2013 and 15% in 2014. So in villages, the users of internet jumped from 3% to 15% in a span of four years. Again we can calculate that in villages the rise in 2011 is’2%, in 2012 it is 3%, in 2013 it is 2% and in 2014 it is 5%. In towns the rise is calculated as 5% in 2011, again 5% in 2012, 7% in 2013 and 13% in 2014. Therefore, if we compare the towns and villages we notice that the percentage of internet users rises much faster in towns than in villages.